What We’re Talking About: This is a testimony more than a review of my experience at Greens n Olives. A meal for four came up to Rs.2000 as on date. 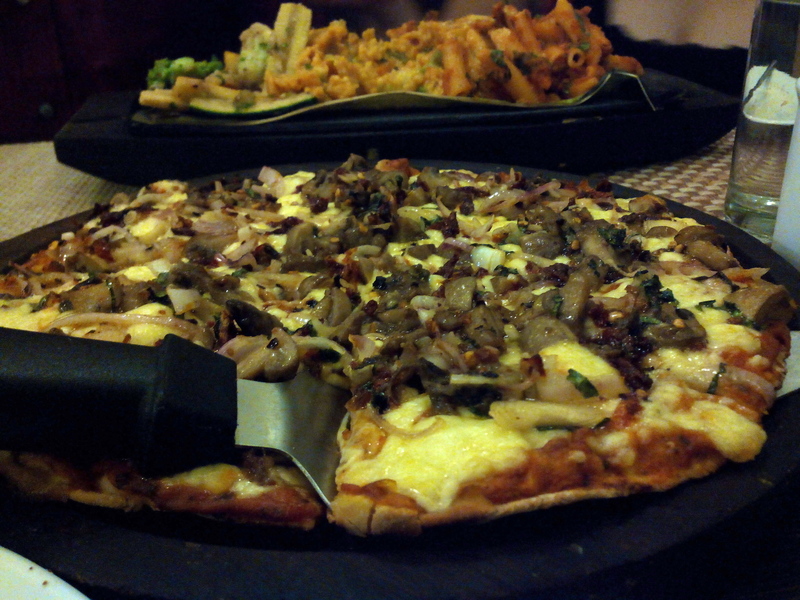 It includes a list of great vegetarian options that have come up in Pune in the recent past. Enjoy the Global dining designed for vegetarians in the city. All senses alert, scanning through the jungle aka menu for my prey, eyelids narrow like a shameless and greedy hunter to attack that target, the crisp, honey gold crackling skin of a roasted thigh that veils the supple, moist and tender meat within. What do I say? Us carnivores, we love our meat! Bury our head into the plate (though I do use my cutlery) and then wipe it clean with that intense, meaty brown sauce. So clean, I bet you can’t tell my plate apart from a clean one. That is just to explain that when it comes to true blood, hungry non-vegetarians, vegetables are best served only as the side. What if there was no thigh or breast on the menu? (Ha ha very subtle!) Putting up a ‘yumminess’ face, pretending to have a ‘bitchin’ time eating at a vegetarian restaurant over chicken thighs for my mother’s birthday was going to be tough. Until I tasted the vegetarian food at Greens n Olives I was secretly missing my meat. There is no doubt that this place can convince us carnivores to surrender to the yumminess that is its vegetarian food. So far we have had a certain cliché understanding of vegetarian menus, with Shiv Sagarz and Sukh Sagars of the world serving us “Pure” vegetarian, Pav-Bhaji, Masala Dosa, Idli Chilli and Pizza aka Pijhha. Italian has always been a wonderful option for vegetarians eating out, but few Italian Restaurants are “Pure” vegetarian. In Pune, especially the Aundh area and its vicinity have more restaurants that offer Indian, Chinese with a tiny section called Continental with (often) unappetizing options. 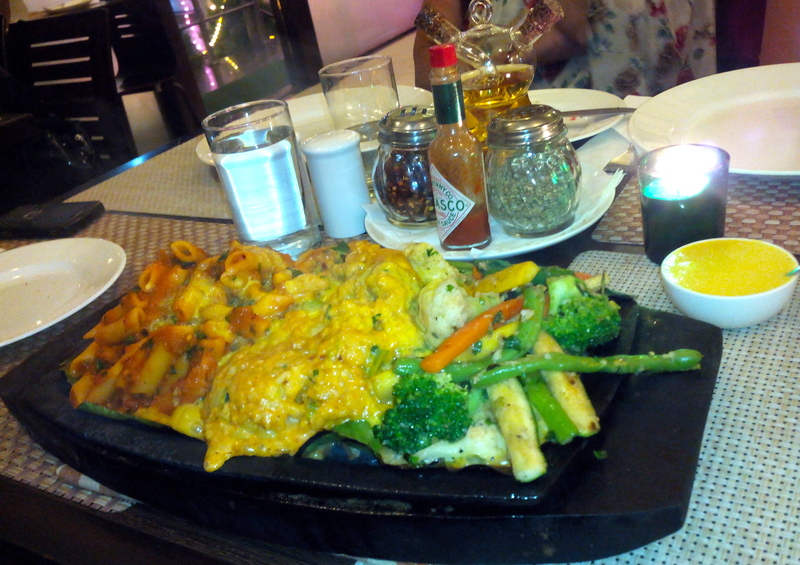 The selection of Italian, Mexican and Indian food along with a selection of Sizzlers at Greens n Olives was a breath of fresh air in the world of vegetarian menus. Usually you don’t even need to look at the menu to decide whether you want paneer makhani or mushroom chilli but carry your glasses for this one, they have options like Lebanese platter and an Italian Sizzler. The A la Verdure Pesto Soup, Olive Mozzarella Crostini and Cheese sticks with mustard mayo were a luring promise and we couldn’t wait to get the main course on our table. We went for the Italian Sizzler, a Sicilian Pizza and Vegetable Rahra with Butter Kulchas to mix it up and try a variety from the options. The Italian Sizzler was the first to appear within minutes of placing the order. The silken and comforting creaminess of the saffron risotto with firm, yet soft grain that would disappear the moment the mouth acknowledged its presence. And what a tease for the tongue that impactful spike of garlic was, and what a soothing aroma the sprinkles of parsley added. The portion was so large, my father and sister had to share it as my mother and I stole a few bites, yet no one wanted to stop eating it and miss their turn of spoonful of that risotto. Next was the Vegetable Rahra with butter kulcha, which was a delightful and full of robust flavours but this classic favourite red gravy was overshadowed by other interesting options. Drumroll for my Sicilian Pizza please! As the crispy percussion of the base crackled and crumbled in my mouth, the garlic raised his pitch, then red chillies peaked like opera singers and the deep notes of mushrooms pulled the song into a perfect balance, as the cheese brought it all together in a chorus to make a matchless symphony. Distract yourself with the hearty tomato sauce pizzas but this one is an untold story. Our evening was wonderful, all thanks to a happy staff. They were smiling, talking to us and even telling us the names of all the fancy looking dishes that the people on the next table were ordering. It seemed almost like their best friend in the kitchen was waiting our verdict, when they asked us eagerly how we liked the food. Well the verdict had to be positive, didn’t it? Cause this place has that happy spirit of Italy. The friendly attitude of Italian people, with bright European style lights, the walls were a pretty picture done up like Italian window sills loaded with bright flowers that reminded me so much of Italy. Such a happy place! They had a very tempting dessert menu. Possibly the most luring one around this area, with apple crumble, mud cake mousse to a moist chocolate cake with cherries. The description was very tempting but we were so full after the soup, appetisers and main course that we decided to comeback another day, just for the appealing desserts. There are a few things that will complete this Italian feel and make the meal at Greens n Olives more memorable. I would really like to have a glass of wine with my meal when I’m here. I was told that my wish would be fulfilled as soon as their liquor permit comes through. Fresh pastas like ravioli and gnocchi are pure joy and there presence in the menu was missed. It was a delightful meal that would be complete with some fresh pasta to offer. My heart was singing anyway, so this is a mere nudge for greater joy, a live band playing Italian songs for the diners will be a fun addition. Earlier on there were fewer options for vegetarians, especially ones who preferred dining at an all-veg or “Pure” veg restaurant. With people travelling the world more and thanks to food shows and facebook, there is more exposure to Global Cuisine. This has resulted in the opening of a number of speciality, vegetarian restaurants that offer a great variety to vegetarians. My favourite vegetarian restaurant is Shakahari at the JW Marriott Pune, which even features vegetarian sushi, Asian and a variety European food during different food festivals around the year. If you’re a vegetarian searching for a buffet of great cuisines and delicious food then look no further than the building next to Pune Central in Shivajinagar. This entire building has vegetarian restaurants. South Indies offers scrumptious delicacies from the South, some even unheard of; Little Italy offers titillating vegetarian Italian food while Soul Kitch offers a selection of Asian favourites. It has always been easy being vegetarian in Pune with Jain food, Mathura’s thalis and Bedekar’s missal pav, but now the majority diners have much more to look forward to in Pune. So, Jain, Brahmin or Vegan, your choices are wide. Rajwar Festival in Rajdhani; Is It Worth the Extra Cost? Why I would prefer going to Rajdhani over other Thali places in Mumbai? It is because of their delectable sweets. The sweets at Rajdhani have won the battle of Thalis for me. It was a good thali until I had the sweets, and then it crossed the line to extraordinary. We were visiting the Phoenix Market City, Kurla branch of Rajdhani on invitation. While this branch is far, far away, the food of Rajdhani has always been promising so we didn’t mind the travel. Although if I were you, I would go to the branch closest to work or home since the all branches of Rajdhani are running this festival till the end of this month. The Rajwar festival is conceptualized around the food served to Royalty and therefore offers richer food with more number of items compared to the standard thali in Rajdhani. The servers are also dressed in Royal-style uniforms. The festival attempts to bring Royal style of cooking to your table. The fragrance of pure desi ghee in the food is testimony to Royal meals. Are both Thalis available? During the Rajwar festival, the standard Thali of Rajdhani is not available. Regular was for Rs.325 (Kurla) – It consists of a variety of vegetables, dals, kadhi, breads and sweets. The number of items is fewer in comparison with the Rajwar Thali and a welcome drink is not served as part of the meal. Versus Rajwar Thali for Rs. 375 (Rs. 425 for dinner and on Weekends) – Consists of 5 or 6 more items than the standard thali. It includes an extra starter, a welcome drink, jalebi, malpua and rabdi, new fruit halwas such as apple, chikoo and pineapple have been introduced, Phirni has been included, one extra vegetable is also served in the Rajwar thali. Gatte ki sabzi and Dal Bati Churma which are otherwise rotating items on the menu, will be served on all days throughout the festival. It also includes a refreshing pan shot at the end of the meal which was yummy! There is no point in me mentioning each chutney or farsan served on the thali. I am just going to tell you the great dishes from the disappointing ones. Chikoo halwa – lightly sweetened, this chikoo flavoured halwa was not too heavy on the stomach, nor was it dominated by the ghee in it. It was light and beautifully flavoured. I wouldn’t have tried it if everyone at the table weren’t raving about it already. Malpua & rabdi – Out of this world! The texture of these tiny malpuas crisp on the sides, soft in the center dipped in light sugar syrup, smeared with rabdi. The extraordinary thing about this dish was that from the looks of it, it seems too sweet and heavy but it is so smartly executed that all you experience is the wonderful flavours and texture in your mouth. It is unlike other experiences where in you feel that your tongue will stick to your palate with the sugar in it. This was the Star dish of my meal. Jalebi – The tiny mouthfuls of warm, crisp jalebi was dipped in a saffron flavoured light sugar syrup. Making it more appetising even after a meal than jalebis are for breakfast. Kadhi – plain kadhi usually has limited scope for note worthy flavours. The thickened buttermilk was flavoured with a little ghee giving the kadhi so much character. Masala Khichdi – with some vegetables and lots of ghee this khichdi was much better than regular khichdi. Lasan Chutney – very spicy, lip smacking and delicious. Hari Moong Dal – was flavoured with spices. Phirni – was good, not too sweet. Biscuit bhakri; it is interesting concept, but doesn’t work on the grains used to make bhakri. I have eaten other biscuit forms of bread, this one was very hard to bite. I didn’t enjoy it. 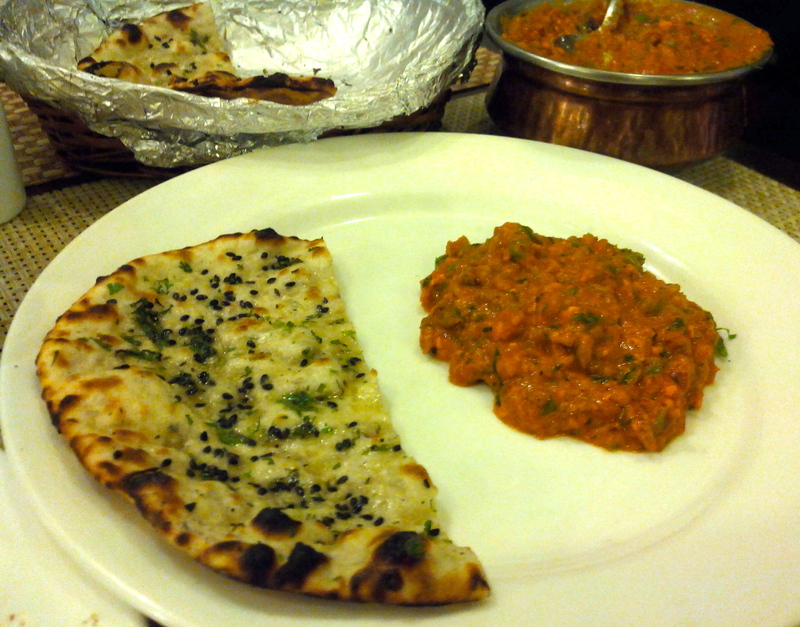 Shahi Gatta – the gatta was too dense and unappetizing. I liked the gravy of this dish. Churma – lack of flavour made it seem like an unmotivated cook prepared the churma. Dahi bada – was also too dense and not palatable. Patra – was also very dense and lacked flavour. It is worth mentioning that the Rajdhani group intends to maintain the cost of the Thali at Rs. 375 even after the festival, as mentioned to me by Mr. Aji Nair who is the F&B Vice-President with Rajdhani. It is only fair since with the amount of pure ghee added to the food. We were also taken to visit the kitchen where food is freshly prepared in batches, with good quality ingredients in a hygienic space. With the prices of food, fuel and other items rising, it is unfair to expect restaurants to be serving food at the same old price without compromising the quality. Some popular items of the festival are also likely to feature in the standard thali after the festival ends. If you were planning a trip to Rajdhani, it would be a smart decision to go for the Rajwar festival for the extra items and richer and tastier food. The price of the standard thali may or may not be the same as it was earlier. Service – In my experience, traditional Thali restaurants have the best and the most courteous service compared to other restaurants. The true meaning of Indian hospitality and culture is reflected in their service. On my previous visit to Rajdhani I found the servers to be polite, courteous and prompt. On this occasion the service was exceptional, however, I will except this aspect of the review since we were there to review this festival on invitation. The service staff has also developed their own sign language to interact with each other to bring a particular item to the table. Using these signs reduces chaos, confusion and loud noises in the restaurant. It was interesting to watch them interacting in their ‘thali’ language. Do I recommend a visit to the Rajwar festival? Yes, for the malpua, rabdi and jalebi, which were out of this world. I am not a sweet tooth and neither am I a big fan of malpua or jalebi. Most of the time I prefer to skip the sweet course, so believe me when I say it was gorgeous. It was so good, that me, a ‘no-sweet-for-me’ person loved it. Sweet tooth or no, you must try their new range of desserts in the Rajwar festival and that is the thing about this place. With many tasty items in this selection I intend to visit again, this time with family.